I've got a new column up on Kirkus Reviews this morning. 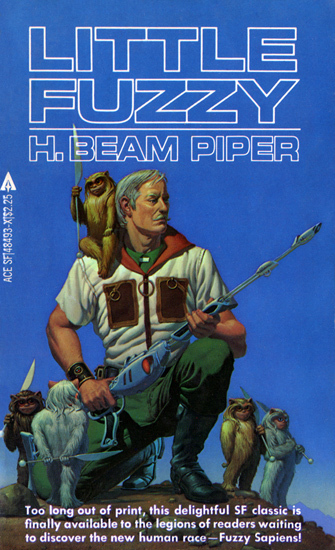 This week, I'm looking at the career of H. Beam Piper, a science fiction writer who was active between the 1940s and 1960s, famously known for a book called Little Fuzzy. I first came across Little Fuzzy because of John Scalzi's reboot, Fuzzy Nation. (My review is here — given that I wrote it six years ago, I'm a little afraid of how terrible my writing was) Before Scalzi's novel came out, I picked up Piper's, (it's in the public domain, so it's a free ebook) and found it to be an interesting read. Scalzi takes the story in a different direction, but both are well worth picking up and reading. Go read The Little Worlds of H. Beam Piper over on Kirkus Reviews. Mike Ashley. Gateways to Forever: The Story of Science-Fiction Magazines from 1970 - 1980. Ashley's book, as always, is an exhaustive, interesting read into the history of the genre, and provides some good background on the time that Piper was writing. John Carr. H. Beam Piper: A Biography. This is an exhaustive resource on Piper and his work. Carr goes in detail, often day by day, talks to friends and family, examines letters, and so forth. Paul Carter. The Creation of Tomorrow: Fifty Years of Magazine Science Fiction. Carter's book provides some good background and a couple of interesting points on Piper's career. Adam Roberts. The History of Science Fiction. Roberts provides some good background on where Piper fit into the larger history of SF.